It seemed S3 was the season for Sam to wear ugly shirts. This is another questionable plaid – this time orange and white. A slight western style with two peaked diamond-shaped-snap flaps on the breast pocket. 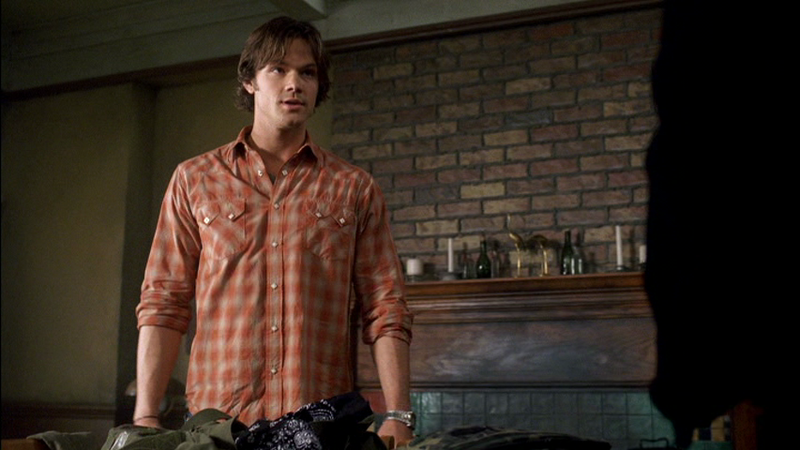 In Bedtime Stories (3x05), Sam wears this shirt when he and Dean go to check out the old woman’s house in the woods. He leaves it on for the rest of the episode, including his confrontation with the crossroads demon. In Wishful Thinking (4x08), Sam wears it at the beginning of the episode when he and Dean are at the bar. In A Little Slice of Kevin (8x07), Sam wears this shirt at the motel the day that Cas finally appears behind Dean in the motel’s bathroom. He wears it for the rest of the episode. In The Great Escapist (8x21), fake!Sam wears this shirt in his second scene when Kevin sends him and fake!Dean out for food. In Holy Terror (9x09), Sam wears this shirt when he and Dean are in the bunker after having had beers with Castiel. He changes out of it sometime before Gadreel’s second talk with Metatron. In Mother’s Little Helper (9x17), Sam wears this shirt when he goes to investigate the convent and find the jarred souls. In The Things They Carried (10x15), Sam wears this shirt at the beginning of the episode when he and Dean are in the bunker and hear about the possible case. In The Bad Seed (11x03), Sam wears this shirt when they are in the Bunker at the beginning of the episode, trying to track down Rowena while Cas fights the curse she put on him. In Safe House (11x16), Sam wears this shirt at the very beginning of the episode when he and Dean are in the diner. In Mamma Mia (12x02), Sam wears this shirt at the end of the episode when they are finally able to have a family dinner, and Sam then brings Mary tea. In Ladies Drink Free (12x16), Sam wears this shirt at the beginning of the episode when they are in the BMoL headquarters, as they drive to the hunt’s location, and until they check into the hotel. I actually love this one haha. He wears it in "Party On, Garth" in season 7 as well. He looks so soft and kind in it haha.